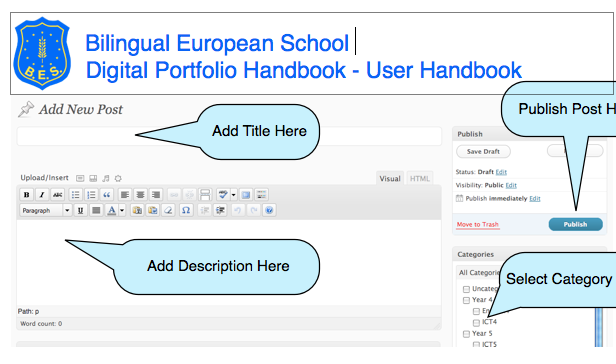 Our school requires digital portfolios for the students who are in Year 4 and higher. The students write reflections on selected work that shows their progress over a period of time. The previous teacher had the students use a simple WYSIWYG software to create their portfolio websites. They were then housed on our school’s internal server. Coming from a web design background I knew that I wanted to use a simple CMS to allow the students more flexibility to keep their portfolios up to date. I reviewed a few programs and narrowed it down to either Concrete or WordPress. In the end, I chose WordPress, maybe more because of my previous experience working with the software. It was also much more flexible with all of the available plugins. I installed WordPress MU on our school’s server and create all of the students accounts for them. This was very time consuming and in retrospect maybe I could have done it differently. I also created a WordPress theme for the students to use for their portfolio. I held PD workshops for the teachers and spent most of the second half of the year helping the students insert their work into the portfolios. This was a problem mostly because the students could only work when connected to our school’s network. We only have 11 portable computers and the computers in the lab for the students in all 7 classes to work on. This issue will have to be resolved next year because I lost to much actual teaching time working on the portfolios.